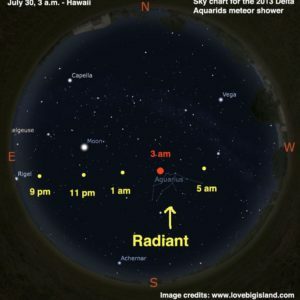 If you are on Hawaii the night of (or close to) one of the following dates, it is time to count your lucky (shooting!) stars. 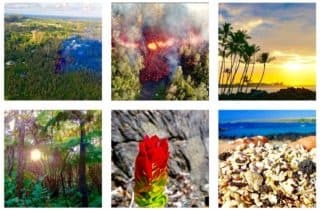 January 3rd, May 6th, July 29th, August 12th + 13th, and December 14th are the best nights to watch shooting stars on the Big Island. Going out at night to see a meteor shower requires only a little planning, and is bound to leave you with good memories and loads of wishes (1 per shooting star). You’d better prepare a long wish list! 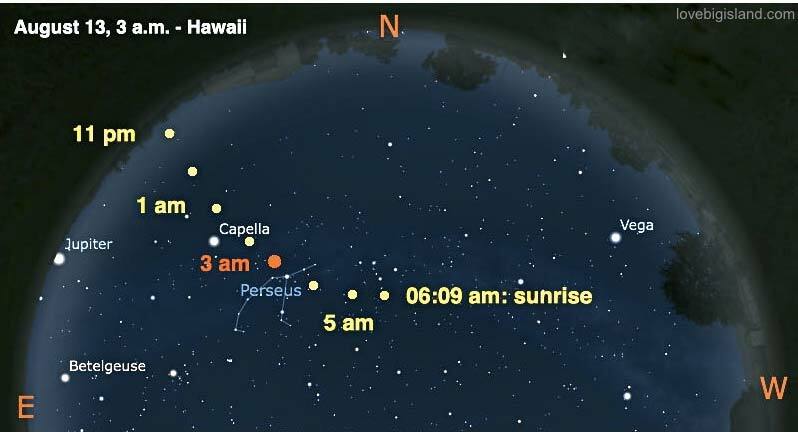 Read more about when to see meteor showers on the Big Island in our Hawaii Stargazing Calendar. The “quick and dirty” guide to meteor watching is to pack a blanket and pillow and some picnic supplies. Go to a dark place without to much light pollution and look up. The Big Island with its low population density has many places that are perfect for this! A Skymap helps you find shooting stars during a meteor shower. 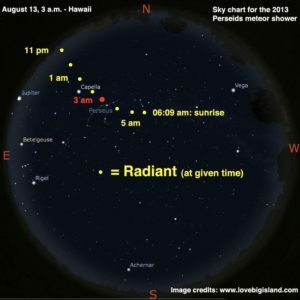 You can find Hawaii sky maps for all popular meteor showers on our astronomy blog. Which showers are best viewed from Hawaii? What is the best place for meteor watching? Where in the sky do you look for the best results? What is the best time of night to look for shooting stars? The stargazing event of the year is for us is the total lunar eclipse visible from Hawaii on January 20, 2019. A close runner up is the Quadrantids meteor shower early January. This shower peaks during dark(ish) skies, which means viewing conditions are great! To spot the most shooting stars in the meteor shower, find the darkest spot possible! The darker the surroundings, the more shooting stars you will be able to see. Stay away from city lights or active volcanoes, and try to pick a part of the night when the Moon is below the horizon. It also helps a lot to be on a high place. The highest place on the Island is the summit of Mauna Kea, but this is a very unpractical spot for a couple of reasons (freezing temperatures, altitude sickness and limited accessibility to name a few). Volcano Village or the Hawaii Volcanoes National Park are great spots to watch a meteor shower. Go to the Park on a clear night, set up camp on a spot where you cannot see the glow from the Halema’uma’u or Pu’u o’o crater, and get ready for the show! Make sure to look up the weather forecast before you go out. Volcano can be cloudy, and watching fog (volcanic smog) is not as much fun as counting shooting stars! If Volcano is not an option, or if you like an ocean-view while looking for shooting stars, any other dark place outside of the city (with low light-pollution) is also good enough. Just be prepared to see a couple of times less shooting stars from sea level as you would from 4000 ft. Finally, it is extremely important to make yourself comfortable! There have been times that I have been out for hours to watch the shooting stars, and you want to be comfortable all this time. The following tips are essential for keeping Meteor watching fun. Because you will not be moving most of the time it is possible you will get a bit cold – especially if you go to a high place to watch the shooting stars. Bring warm clothes and/or a blanket! Also, bring something to sit or lie down on. You have to look up at the sky a lot, so it is best if you bring a beach chair to recline on, or a picnic blanket to lie down on. Be smart and take a pillow to rest your head on to look at the stars without straining your neck! What should you pack to watch a Meteor Shower? Prepare a wish list. It is fun to do and believe it or not, you will run out of wishes quickly if the shower gets going! Bring warm clothes. Early mornings can be chilly even in Hawaii. For comfortable watching, also pack a picnic blanket (or something else to lie on) or beach chair. Take some snacks and (hot) drinks to keep spirits high (have a look here for suggestions about typical Hawaiian picnic snacks). A pillow is nice to rest your head on while watching the skies. Bring a flashlight, but turn it off when you are ready to start watching. Allow your eyes 5 to 10 minutes to adjust to to darkness. A sky map shows the sky above a certain place (in this case: Hilo) at a certain date and time. The sky maps we present here are representations of the sky above Hilo early in the morning before sunrise during the peak of each meteor shower. They are meant as a guide to help locate the radiant position of each meteor shower. The Radiant of a meteor shower is a spot on the sky from where all shooting stars seem to originate (read more about the radiant here). Each radiant on the sky maps is marked with a red cross. The arrows on the map show what shooting stars will look like coming from the radiant. If you are taking your smartphone, it is really easy to find the radiant. Star Walk (USD 4.99, app store) for the iPhone or Google Sky (free, google play) for Android are neat apps that allow you to point your phone towards the sky and quickly find any star you want! On the bottom of the sky map we show the horizon and cardinal direction (North,East, South, and West). Because we show a large part of the sky the horizon looks curved. A sky map is not necessary to find shooting stars during a meteor shower, but it is handy and can keep you entertained through the night. For example, we have also included all visible planets, as well as some of the most well known stars and constellations. You can spend some time during your meteorite hunt looking these up. All sky maps are created with Stellarium. Stellarium is planetarium software that shows exactly what you see when you look up at the stars. It’s easy to use, and free! If you cannot print out these sky maps, don’t worry. It is easy to find the radiant without the use of these maps. Just scan the sky all around until you see a shooting star, and keep looking in that direction. After a while you will see more and more, and all falling stars will appear to come from the same region in the sky – this region is the radiant! Shooting stars are little pieces of space-debris (typically little pebbles and dirty ice balls, smaller than a pea!) that are swept up by our Planet as it orbits the Sun. As soon as the Earth comes close enough to these particles, the pebbles and ice balls are swept up by Earth and start falling towards Earth’s surface. As they fall they get very hot, just like Space Shuttles, who need an extremely advanced heat shield to safely return to Earth. The space debris does not have these shields so it gets hotter and hotter until it gets hot enough to burn and disintegrate. We see this red-hot particle of space debris that burns as it falls towards the Earth surface and call the streak of light it leaves on the sky a meteor or shooting star. This may not sound as romantic or exciting to you as “shooting star”, but that is actually not true! Shooting stars are remnants of the birth of our solar system (4.5 billion years old!!) and have not changed since. They are older than any rock you can find on the surface of the earth. These fossils move through space at thousands miles per hour. How is that for exciting! Meteorite, Meteoroid, Meteor, Comet, Shooting Star or Falling Star? Are you confused about these names? They actually all refer to the same object! There is no shame in your confusion, because even most professional astronomers won’t be directly able to tell you the difference. Now, if they all refer to the same (pea-sized) object, what exactly is the difference? The difference is their location! A small piece of rock (typically, boulder size or smaller) that is moving through space, it is called a Meteoroid. If the particle is bigger than boulder size, it is called a Comet or Asteroid. As the meteoroid enters Earths atmosphere it is called a Meteor (or shooting star, or falling star). Most meteors are so small that they burn up in our atmosphere at about 60 to 80 miles height, but some are not! If the meteor is big enough to survive its descent and hit Earths surface, the remaining piece of rock is called a Meteorite! And in Hawaii? Have a look here if you are curious about the role of meteors in the Hawaiian language and culture. What is a Meteor Shower, and what does it have to do with Comets? If you are lucky enough to look up at the right time (If a particle, or meteoroid, floating around in space gets swept up by our planet), you see a shooting star. Most of these meteoroids travels through space alone, but there are meteoroids that travel through space in a group. This group is always traveling in the same orbit as an (extinct) comet. Do you know why a Comet has a tail? A Comet is basically a very large, fluffy and dirty ice ball made out of ice, dust and pebbles. If a Comet comes close to the sun it gets warm and the icy surface starts to melt. Pieces of the comet fall off and stay behind as meteoroids. The Comet leaves a trail of ice and dust, and at certain times each year Earth flies through such a trail! When this happens you can see lots of shooting stars. It takes a while for Earth to travel through the trail of the Comet, sometimes up to several weeks. During this time you can see many falling stars – but the best time to look for shooting stars is in the middle of the period, or the “Peak” of the Shower. What is the best time of night to find Shooting Stars? You can see shooting stars during any time at night. However, you can see by far the most meteors after midnight. This has everything to do with the rotation of the Earth. Between sunset and midnight, you are on the trailing edge of our planet as it orbits the sun. The meteors you see during this time have to ‘catch up’ to Earth, which is not that easy. Between midnight and sunrise Earth’s rotation has brought you on the leading edge of our planet, and Earth can sweep up many more meteoroids! The speed of the particles that Earth sweeps up also increases after midnight, which makes the shooting stars brighter and easier to see. There is an extremely handy calculator online that allows you to calculate the best time (to the minute!) to watch a meteor shower. As a bonus you can also see how much difference it makes if you stay downtown, head out to the countryside or even to a mountaintop. You can find the calculator here. Choose from the drop down menu the following values: Meteor Shower (whichever one you want to see), nearest city = Honolulu (the closest city in the drop down menu), location (downtown, suburbs, countryside or mountain top), and date. Use the date for the meteor shower you want to see from the table above and make sure to also put in the correct year! Why do all shooting stars appear to come from the same point? Other than meteor showers that you can see in disaster movies, shooting stars during a real meteor shower appear to be coming (“radiate”) from only place on the sky. This place is caller the “radiant” of a meteor shower. This is because the shooting stars are actually pebbles and dirty ice balls that get swept up by our Planet as it orbits the Sun. Think if it as bugs on your windshield. Bugs fly all around your car, but only your windshield collects them. In the case of a meteor shower, the windshield would be the radiant. 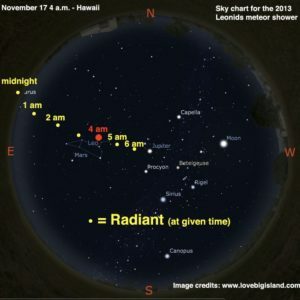 The radiant for each meteor shower is different, and is used to name the shower. For example, the radiant of the Perseids lies in the constellation Perseus, that of the Geminids in the constellation Gemini, and so on.